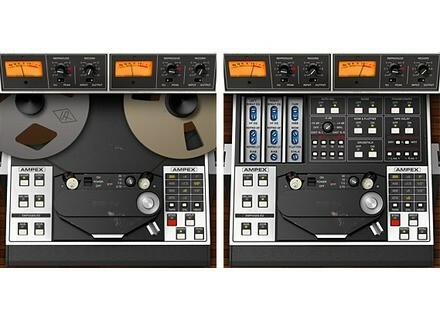 Ampex ATR-102, Tape/Vinyl simulator from Universal Audio in the UAD Plug-In series. Same install as with all U-audio plugs. Download the updater and license, run it, installed...restart...good to go. And of course it does the usual U-Audio 2 week demo timer if you wanna try it. I'm running it with Protools 9 HD as well as Protools 10 and Logic 9. No issues whatsoever. Also have used it with Nuendo 5.5, Cubase 6. The UAD Ampex ATR-102 provides all of the original unit’s desirable analog sweetness. Like magnetic tape, users can dial in a clean sound, or just the right amount of harmonic saturation. The primary purpose of the UAD Ampex ATR-102 is to obtain tape mixdown sonics within the DAW environment. To obtain the classic tape mixdown sound, instantiate the plug-in as the last insert on the output bus, after other processing is applied (or possibly as the second-to-last insert, before a brick-wall processor such as the Precision Limiter). Of course, creative “non-standard” results can be obtained by placing the Ampex ATR-102 in any channel insert or on busses in a send/return configuration. The UAD Ampex ATR-102 models seven popular magnetic tape formulas. Each type has its own subtle sonic variation, distortion onset, and tape com- pression characteristics. The tape types that can be selected depend on the active tape speed and head type; all tape types are not available for all tape speeds and head types. Lower fidelity types are included to facilitate more signal coloration options. The original hardware machine was manufactured with an interchangeable head block system which enabled the system to be quickly converted to use ei- ther 1/4” or 1/2” tape stock by simply swapping out the heads and recali- brating the electronics. As track width increases, subtle improvements to sta- bility, fidelity, and noise become apparent. A popular custom aftermarket tape head is available which enables the use of 1” tape stock, enabling even higher fidelity with its greater track widths. All three tape head widths are ac- curately modeled and selectable in the UAD Ampex ATR-102. All four tape speeds in the original hardware are modeled in the UAD Ampex ATR-102. Speeds of 3.75, 7.5, 15, and 30 inches per second (IPS) are avail- able. Each speed provides distinct frequency shift, head bump, and distortion characteristics. Higher speeds have higher fidelity; 3.75 IPS has a distinc- tively “lo fi” character. Tape machines can be setup with different calibration levels, which entails set- ting unity gain from input through output based on the magnetic flux (amount of magnetic field) of a given tape formulation. Different calibration levels pro- vide different tape response characteristics for a given level into the recorder. Four selectable calibration levels are available in the UAD Ampex ATR-102. Tape recorders have inherent signal noises that are a by-product of the elec- tro-mechanical nature of the machine. While “undesirable” tape system noise is historically considered a negative and was an attribute that pushed the technical envelope for better machine design and tape formulas (and ulti- mately, “noiseless” digital recorders), noise is still an ever-present character- istic of the sound of using tape and tape machines. The UAD Ampex ATR-102 models the hum, hiss, wow, flutter, and crosstalk characteristics of the original hardware. These noise components can be in- dividually disabled, adjusted, and/or exaggerated for creative purposes (even though the servo-controlled, direct-drive capstan tape transport of the original hardware provides excellent wow and flutter specifications). The original hardware was manufactured with isolation transformers, which can color the signal. A common modification to the hardware tape machine eliminates the transformers from the signal path to produce a (subjectively) “cleaner” sound. UAD Ampex ATR-102 simulates the behavior of the trans- formers in the hardware circuit, and can be optionally disabled in the plug-in, providing both sonic options. A popular application of multi-head tape recorders is to employ them for slap- back tape echo effects. If the machine is running in record mode but the re- corded signal is monitored from the repro head (as opposed to the sync head), the physical space between these two heads results in a short delay be- tween the signal sent to the recorder and the monitored signal. When these signals are combined with mixer routings, the classic slapback echo is mani- fest. The UAD Ampex ATR-102 implements the ability to reproduce this classic effect with a simple set of controls, and expands the capabilities by extending the available delay times beyond what is possible in the physical realm. The ability of a magnetic tape recorder, which has inherently non-linear re- sponse characteristics, to accurately reproduce an audio signal with a mini- mum of noise and distortion requires precise adjustments to the system elec- tronics. The calibration settings are based on the current tape speed, formulation, emphasis EQ, and tape width. The hardware must be meticu- lously re-adjusted each time a different tape, speed, emphasis EQ, or head width is used (and for system wear and drift, even if these variables are not changed). UAD Ampex ATR-102 has an automatic calibration feature that tunes all calibration electronics with a single button. Even though automatic calibration is available, the individual controls that ad- just calibration are exposed for sonic manipulation. Playback EQ, record (tape) EQ, and record bias can easily be altered for manual calibration and/or creative purposes. UAD Ampex ATR-102 includes the full suite of tools required to manually cal- ibrate the recorder. Manual calibration tools are provided so expert users can calibrate the system to their preferred methods for obtaining desired results. The manual calibration tools consist of a tone generator (with multiple test tones and levels), a distortion meter with digital readouts, and a full suite of Magnetic Reference Laboratory (MRL) alignment tapes, which are used to cal- ibrate playback electronics. While the UAD Ampex ATR-102 is a true stereo processor designed primarily for use in stereo-in/stereo-out configurations, it will also operate in mono-in/stereo-out and mono-in/mono-out modes. When used in a mono-in/stereo-out configuration, the mono input signal is sent to both channels of the processor, which can then be adjusted indepen- dently. When used in a mono-in/mono-out configuration, adjusting any left or right control will change both the left and right controls (the left/right controls are always linked in mono mode). Set up the plug-in by first adjusting Tape Speed, Tape Type (tape formulation), and Emphasis EQ, or simply select a factory preset. Note that as you lower the tape speed, the tape “sound” becomes more audible. Once this basic setup is made, adjust the L/R Record (gain) levels, for more or less tape/cir- cuit coloration/saturation. Anonymous 's review (This content has been automatically translated from French)" OMG!" Nothing to report on that side as usual with Universal Audio plugins. Rather greedy on the DSP card, but given the performance, you close your eyes. This is not emulation but a miracle. This plug is simply amazing. This is the first thing that I insert when I start a project in my DAW after the Studer A800. It is a pure killing.